While straightening up for dinner guests, I came across a binder of my poems. I paused to read a couple. Their luminosity surprised me. I like to think that all of my moments are lived lucid and present, but they are not. Today I am reminded what a gift it is when someone--anyone with the capacity to do so, in whatever form--forges a luminous moment into matter that can be seen and touched. Even five years later, the sterling clarity I channeled into Wakefield (see also "Beginning(s): The Story") virtually hums from the page in my hands, vibrating its chord again in me. Before I know it I am returned to the equipoise I knew in the moments of its rendering. What an amazing experience it is to be taken like this by surprise, to be unexpectedly and instantly reawakened by a rendering of one's own prior awakening. I remember a poet-teacher years ago telling us, her workshop participants, "Be glad you're a writer. You'll always know who you are. You'll never have to agonize over 'finding yourself'." Her statement rang true at the time, but the extent of its wisdom continues to reveal itself even twenty years later. I would not have predicted then that following this metier would bring me here: to writing a love letter of sorts to myself, speaking my gratitude to the "Muse" and to the poet who showed up for Her. What a gift is this clear, deep reservoir I can sip from, when parched, to restore, to refresh. I offer the poem to you on the chance that you might find some refreshment in it as well. joe pye ranks high among weeds. never worry for self or kin. unequivocal, let’s say, in its forgiveness. I have called it that. in empty hand, arms, bed. stream and tide and wind. I cannot tell you why, my dear. Mark Your Calendar: Open Studio! I am happy to announce that Love's Freeway will be making its second appearance at Jamaica Plain Open Studios this fall. Pictured left is the front (and below, the reverse) of the flyer which will be previewing all over town starting in about a week, and right through Open Studios weekend September 26 and 27. I wanted to share it so that you could be one of the first to get an early glimpse of the show--and advance notice to save the dates! As you know, I did not participate in this show last fall, since I was living abroad. But that means a definite European influence on this year's show! Come stroll the lanes of Dublin, meander the cobblestone alleys of Gamla Stan, Stockholm, feast on the autumn bounty of Provence. And if you haven't yet had a chance to pick up a copy of Love's Way, this will be a great opportunity to do so. 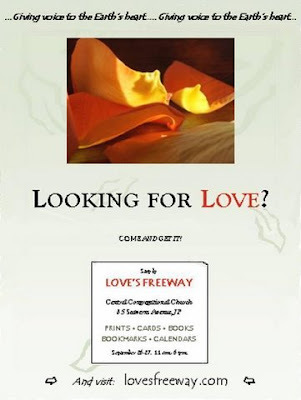 September 26-27, 11 a.m. to 6 p.m.
Love’s Freeway reminds us how well Love—the Life force itself— knows Its way, and how well It does by us when we let It have it. JUST BACK FROM A YEAR on The Emerald Isle. Kathryn Deputat is a Clarityworker, Writing Coach and writer/photographer who has facilitated clear direction and clear expression in lives and in writing for more than 17 years. An alumna of Wellesley College and member of Phi Beta Kappa, Kathryn is founder of Claritywork.com and Love’s Freeway, and author of Love’s Way: Reflections and Practices. I am passionate about Love having Its way: with me, with you, with everything. I facilitate this in classes, groups, workshops, and one on one. I also record and illuminate it in writing and photographically. Ultimately, I am here on this Freeway to give voice to the Earth's heart. All images on Love's Freeway.com are available for purchase, either as individual and/or boxed note cards, or unframed prints, in various sizes. ship. Those first months of getting to know the object of one's affection are all wonder and discovery. "Oh, you like hiking too!" The lovers explore the nooks and crannies of one another--mind, body, spirit. Everything they engage is a first: first kiss, first dinner, first movie, first trip, first quarrel. We all love newness: the advertising industry knows this well! New is nice. Shiny and bright and fresh: what's not to like about that? But new, no matter the realm, doesn't last forever, and before long the lovers find some taste of "been there, done that" on their palates. The newness wears off, and they find themselves growing accustomed to one another. I'll call it a pitfall of longevity. We are always changing, endlessley changing. But log enough miles and you think you know the person with whom you share your life. She's bold or timid, he's bossy or retiring. She's trusting; he's protected. The lovers begin to slip into their expected roles. Lens upon lens accumulates and before long we're looking not at the beloved, but at some impression we've made of the beloved. We see the list of conclusions and attributes we have assigned them. When I hear people talk of falling out of love--"The relationship went stale" or some such--I want to say, "You mean you stopped generating it." Maybe we're watching too many movies. We are steeped in "happily ever after" even with scant real-life proof of it. We get lazy or bored or confronted, and we get out. A lot of the time, at least. I am all too aware these days of the cost of laziness. When I stop generating my relationship, it falters. If I stop long enough, its life is threatened. If we both stop, it just plain fails. This is all well and good for a relationship that has lived its life, but it's tragic, I think, for one that has not. A word about the "confronted" part. Stay with a lover long enough (sometimes not very long at all) and "stuff" comes up. You address it or you don't. You break through, or you don't. Make up? Break up? These crossroads presents themselves again and again between intimates beyond those early stages, seems to me. The shine wears off and there you are: unvarnished, naked before your beloved, with all your imperfections showing. Great. Today I feel newly inclined to say here is where a relationship truly begins--or does not. It is so easy to love the car or the computer, the motorbike or the lover when they are shiny and new. But what happens when the car or the mower or the laptop doesn't start? I don't just toss them at the first--or even second or third or fifth--sign of trouble. I debug, clear out the gunk, cure the virus. I get to the bottom of the trouble and do something about it. And what of the lover? preneur, savvy investor, and all that. But here I sit: Wait a minute... I've seen this challenge before. Same behavior, same result. Am I really surprised? Two years ago, I called a beautiful love into my life. I "tempted fate" some might say, asking Life in explicit terms for such a love. I "placed my order," and in no time at all, Life filled it, exquisitely. Now we are apart, and where we go from here remains unknown. With plenty of time and space for taking stock, I began to see... a lot. I see that I've loved well, and not at all. I did some digging to make some sense of that. Fear came first. But once I cleared that, I set about dismantling the architecture of a misunderstanding. Mine of myself, that is. At age five or so, I took my wonder and curiosity to the kitchen and finding a glowing surface at the Westinghouse, reached to touch it. What I saw looked satiny, and I wanted to feel it. These were the days before Energy Star appliances, before instant on and instant off electric burners. In those days, the coil stayed hot long after turning it off. It makes no sense to me that this happened as I remember it, but it did happen. ment--I wasn't. Rather because I ran screaming across the house to find my mother, and when I found her, she scolded me. It was not her scolding either that changed the course of my life. Rather, it was what I decided it meant. I had needed comfort, love--first aid! What I got in the moment of what felt like grave emergency was punishment. I hold no grudge over this, mind you. I sorted it out with my mother years ago. "Well, if I did that, it was because I was afraid for you. I was trying to teach you, to protect you," she concluded, although she didn't remember the incident. Her explanation made perfect sense of course to my grown up mind. But to my five-year-old mind, in that moment of crisis, her actions made no sense at all--neither logical sense nor emotional sense. And when I span the trajectory of my life from that defining moment forward, I see just what I did with that internal dissonance. If I could not trust my mother, of all people, to love me right, who on earth could I trust? No one. I could trust no one. That's what I made up. With that, I resolved the dissonance. In an instant, I decided that there was a right and a wrong way to love me, and that people just couldn't ultimately be trusted to get it 'right.' Boy did I ever seal my fate. At least for a time. Some of this landscape is not new to me. In fact, I thought I had cleared myself of this particular interference some years ago. But my latest expedition within has revealed a new layer previously blind to me. I had two big clues, keywords "competence" and "confidence." "Be confident and competent--flawlessly so--or I'll declare you unfit as well." I never said it, but I was it. Who can make a move with that around? And was my mother incompetent, unconfident? I needed love, and I got punishment. That's all my stunned, panicked little self knew. And she knew she would be in no hurry to risk this happening again; she would take matters into her own little hands. I'd determined my mother couldn't be trusted. Was that true? No. Not objectively, no. But I made it true. I made it all true, over time. And with my proof I kept laying more road for my parade of "unfit Love-ers." "Love me right or else...!" To leave one no room for error: where is the Love in that? To hinge my well being on another's actions: how does either of us tolerate that? The lover did not fail me. My mother did not fail me: I failed me. I said there was a right and a wrong way to be loved. I said she couldn't be trusted. I could have called her scolding a mistake. I could have spoken up, asked for what I needed. But I spoke nothing. I just carried on like nothing ever happened. But something most definitely had happened. I had closed the door on Love loving me Its way. I took the reins from Love, and have been paying for it ever since. So have those I've loved the most. Is it any wonder that four decades or so down the road you'd find me here, pouring so much love, delightedly and joyously, into this vehicle for, this testament to Love having Its way?! I could be harsh and call myself a hypocrite: "Hah! 'Let Love have Its way' with everyone but yourself!" But up until about two hours ago, I was blind to this particular architecture I had unwittingly constructed at five. What a master builder is the subconscious mind, in its well-meaning efforts to protect us from avoidable pain. It does the job, but seals us off from parts of ourselves, from the true depth of experience, the full breadth of life in the process. I did not know before now that I was throwing this interference in Love's way. I had thought that way was perfectly clear. I thought wrong. lishes that. "Breakdown, breakdown, breakdown: throw it out!" Many reach this place and call it quits: "You push my buttons; I push yours. Oh well." I considered this view briefly. But I have settled on a different, less popular view, if the divorce rate is any indication. It's staying that's run me rich with Love this newborn freedom's let to flow. Tonight is crickets and open windows, short sleeves and goat brie. Today was riding and breezes and traffic blockages that flowed as soon as I relaxed into them. And over and above all is an open heart--a confident and clear and joyful heart--that is happy I have returned myself to my proper alignment. A close friend has come, stayed for a few days, and now gone. But the mark of her visit remains. What a gift is friendship. The moon is coming now, and the cricket sound is soothing as I work late into the evening, catching up from my three days of (mostly) play. A good movie is waiting upstairs for later. Chicken and potato in the oven, just cooked. Viognier is chilling, uncorked. Today Life offered these and I said Yes! It's so simple to be joyful.